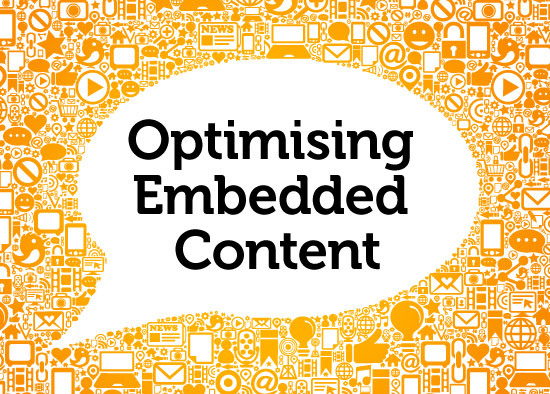 Optimising your embedded content – the MicroWay! If you feature embedded content on your website such as iframes or video’s then you may be missing out on optimising that content. Most embedded elements lack search engine friendly data which gives it little to no chance to show highly in online rankings. It’s important to feature structured data on your site and with the growing number of content management systems it’s important to check your key data can be found. CMS’s such as WordPress or Typo3 will format data into HTML in different ways making it increasingly harder for search engines to find the key structured data buried within. By using Microdata you can help solve this issue by providing HTML tags that search engines can read, this includes Bing, Google, Yahoo & more. This in turn will improve search results as many search engines rely on this type of information when determining what’s the most relevant. Think of Microdata as individual content Meta Data, with Meta Data you have a Title, Description & Keywords. It’s very similar to Microdata as it uses such properties as Item Type, Item Property Name & Item Property Description. With these extra tags to add to your content it gives you the opportunity to maximise your SEO and optimise key data across your website especially if it’s embedded or third party. At Wisetiger, we provide services in integrating these up to date ‘best practice’ processes into a content managed system such as Typo3. The latest versions of Typo3 support the ability to manage microdata. In fact we’re also working on a user friendly extension for our clients that will enable the ability to add microdata to content updates by general CMS users. So you don’t need to be a coder to leverage microdata. This is one of many sites that provide documentation on creating the necessary data for optimising your content such as iframes & video. For more information on optimising your website or content please contact us at: info@wisetiger.co.uk.